Imagine someone asked you, "What is the subject of a sentence?" How would you define it? We know three things are generally required to create a complete sentence: subject + verb + direct object. But, what are they exactly? The subject of the sentence is the noun that is doing or being something. The verb is carrying out the action or linking the subject to further information. And the direct object is receiving the action of the verb. None of this could exist without the subject of the sentence. So, let's talk a little bit more about the place where every sentence starts. You could also say the subject of a sentence is what it's about. That's true enough. But, it's more than that. The subject is the noun that's doing or being something. Let's look at an example. The dog ran to greet his friend. What is the sentence about? The dog. But, the better question is, "Who or what ran?" The dog. And there we have the subject of the sentence. It's doing something, in this case, running. "His friend" is not the one doing something in this sentence. The dog is carrying out the action. With this in mind, let's discuss three main types of subjects. They are: simple subjects, compound subjects, and noun phrases. We'll start with the most basic form. 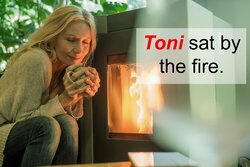 Toni sat by the fire. Can you identify the verb? It's "sat." Who sat? Toni. Simple subjects are just that. They're simple and singular. This also includes singular nouns that describe a group as a whole, like "the team" or "the committee." Toni and Luke sat by the fire. Toni and her brother sat by the fire. Here, we have a mix of nouns and pronouns, but they're all part of the sentence. Who or what sat by the fire? Both Toni and her brother. The next person to speak out of turn will spend the afternoon in detention. Here, we have a noun phrase. Who will spend the afternoon in detention? You might be tempted to single out the word "person," but the subject is not just any person; it's "the next person to speak out of turn." Even more valuable is the time we spend with our children. In this sentence, the predicate (the part that's modifying, or providing further information about the subject) is placed at the beginning of the sentence. This may (or may not) confuse you when trying to pinpoint the subject, as the subject isn't necessarily at the beginning of the sentence. You can begin by asking yourself what's valuable? You'll know the answer is "time." More to the point, you could even say the noun phrase "the time we spend with our children" is the subject. At the start of each morning, we must rise with the sun and meditate for 30 minutes. Can you identify the subject in this sentence? It's headed off with a prepositional phrase ("at the start of each morning") and none of that is part of the subject. Let's look for the verb - "must rise." Who must rise? We must rise. And there you have the subject. It's interesting to seek out the verb first and then search for the subject. But, if you can identify the verb, you can identify the subject. For more on this topic, here are 20 rules of subject-verb agreement. Or, perhaps the better approach is to become a verb master. If you can spot the verb in a sentence from a mile away, then the subject isn't far behind. To beef up your verb skills, read through these 15 classifications of verb tenses. It'll help you pinpoint future verbs with ease and accuracy. "What Is the Subject of a Sentence?." YourDictionary, n.d. Web. 24 April 2019. <https://grammar.yourdictionary.com/grammar/sentences/what-is-the-subject-of-a-sentence.html>. Imagine someone asked you, “What is the subject of a sentence?” How would you define it? We know three things are generally required to create a complete sentence: subject + verb + direct object. But, what are they exactly?The subject of the sentence is the noun that is doing or being something. The verb is carrying out the action or linking the subject to further information. And the direct object is receiving the action of the verb.None of this could exist without the subject of the sentence. So, let’s talk a little bit more about the place where every sentence starts.